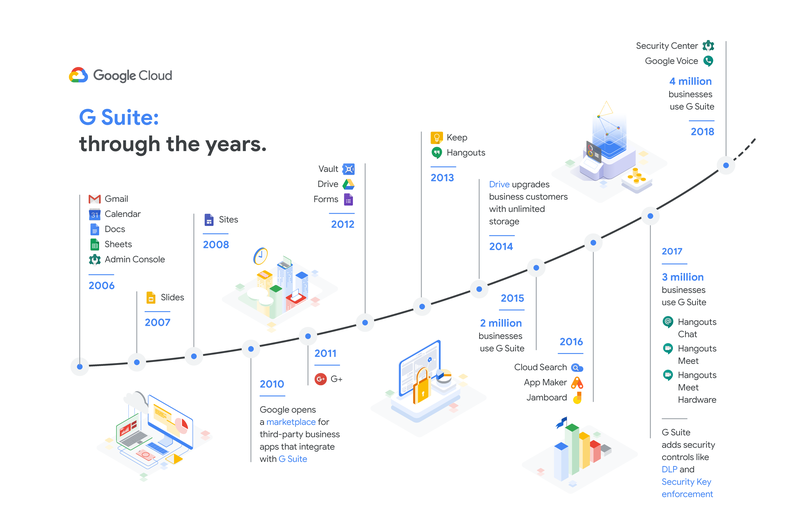 Google today announced that it is raising the price of its G Suite subscriptions for the first time. In the U.S., the prices of G Suite Basic and G Suite Business editions will increase by $1 and $2 per user/month, respectively, while increases in other regions will be adjusted according to the local currency and market. G Suite Enterprise pricing will remain the same. The new pricing will go into effect on April 2; those on annual plans will pay the new price when their contract renews after that date. Usually, a $1 or $2 price increase wouldn’t be a big deal, but this is the first time Google has raised the price of its G Suite subscriptions. The company argues that it has added plenty of new services — like video conferencing with Hangouts Meet, team messaging with Hangouts Chat, increased storage quotas and other security and productivity tools and services — to the platform since it first launched its paid service with its core productivity tools back in 2006. That seems like a fair argument to me, though a 20 percent price increase may be hard to swallow for some small businesses. It’s also worth remembering that G Suite is now big business for Google. There are now more than 4 million businesses on G Suite, after all, and while some of them are surely on enterprise plans with a price point their teams negotiated privately, the vast majority of them are surely on the standard monthly or annual plans.